There is a health crisis in America and Black women and girls are among the hardest hit. 82% of Black women are currently overweight, 53% are morbidly obese (CDC, 2014), and 95% of Black girls, ages 6-11, will be overweight or obese women by 2034 unless diet and levels of activity change. (Garko, Michael, The Journal of Obesity, 2013). Amid an increasingly stressful political climate, Black women’s health could face sweeping policy shifts, unfriendly legislative appointments and changes in government spending. On Friday, January 20, 2017 — the day of the presidential inauguration — GirlTrek, a national health movement and the largest health nonprofit serving Black women and girls in the U.S., will stage a day of healing in Washington, D.C. This day of sisterhood and revolutionary self-care will serve as safe space for Black women to unplug, de-stress and try new activities and workshops led by some of the top instructors in health and wellness. GirlTrek’s Day of #BlackGirlHealing is free, but space is limited. RSVP required. More information to come. GirlTrek is holding A Day of #BlackGirlHealing. 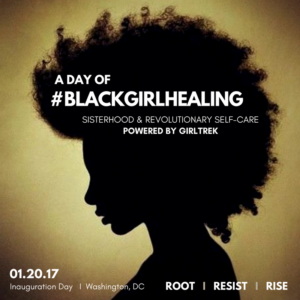 This day of sisterhood and revolutionary self-care will include workshops and activities led by talented Black women that focus on health, wellness, #BlackGirlHealing and lots of #BlackGirlJoy. Friday, Jan. 20, 2017 – the day of the presidential inauguration. Washington, D.C. Location to be announced.